Harry Potter is a wizard. He is in his second year at Hogwarts School of Witchcraft and Wizardry. Little does he know that this year will be just as eventful as the last …even getting there is an adventure in itself! 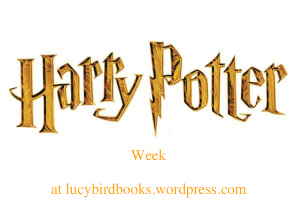 The three firm friends, Harry, Ron and Hermione, are soon immersed in the daily round of Potions, Herbology, Charms, Defence Against the Dark Arts, and Quidditch. But then horrible and mysterious things begin to happen. Harry keeps hearing strange voices, and sinister and dark messages appear on the wall. How much I love his book, for the longest time it was my favourite Harry Potter book, and now it shares that position with Half-Blood Prince (if you have read both you can probably guess what I liked about these two). I must admit part of what I loved about this book is that I felt I was looking for it for forever after having loved Philosopher’s Stone- I must have missed it immediately though because I don’t have a first, or even second edition. My joy when I found it, finally, though was so strong. 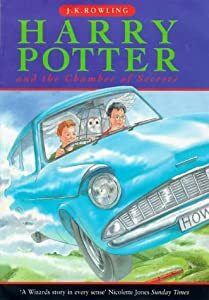 I must admit this is the one book where I really like Ginny, and it’s a book where we first really see her (apart from a small couple of glimpses in Philosopher’s Stone) [highlight for spoiler]as well as a book where Ginny is a very important character. I guess I like the funny little moments when she is in front of Harry she seems so young and innocent [highlight for spoiler] and yes I think that picture of her is important, you would never in a million years suspect Ginny, or at least not until she was going to tell Harry and Ron. And that’s not even mentioning giant spiders, or an angry Snape! I remember her saying something about that but I don’t know what it was…. I’ve been trying to read the HP books forever but am so far behind and the series got so daunting. So this summer we’re doing a family read-along. My husband is reading aloud to us all. (He and my son read them already. My daughter and I are the laggards.) We’re up to book 3, and they’ve been wonderful so far. Such imagination! Hi Susan. I love that idea. I’m glad you’re enjoying them, how is your daughter liking them?